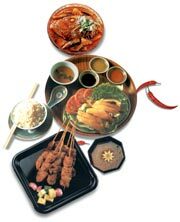 Feast on unforgettable experience as you indulge in the delectable offering of New Asia's most cosmopolitan city, Singapore. * Package price per person, based on double occupancy, in US Dollars and subject to availability; change; weekend/holiday/seasonal suppliments; blackout dates and any restrictions that may apply. Rate does not include US departure taxes and fees of approximately $82. Travel is valid for Oct 1, 2002 - Dec 5, 2002 and Jan 6, 2003 - Apr 30, 2003.